As mass infantry batch painting marches onward, I began looking over my score sheet for Inner Circle. While I have a high model count, It is only 8 of the 18 unit maximum. All eight were not purchased in a Games Workshop store, meaning they were worth two fewer points on my sheet than if they were purchased at GW store. Also, I did not have much conversion work in my army. 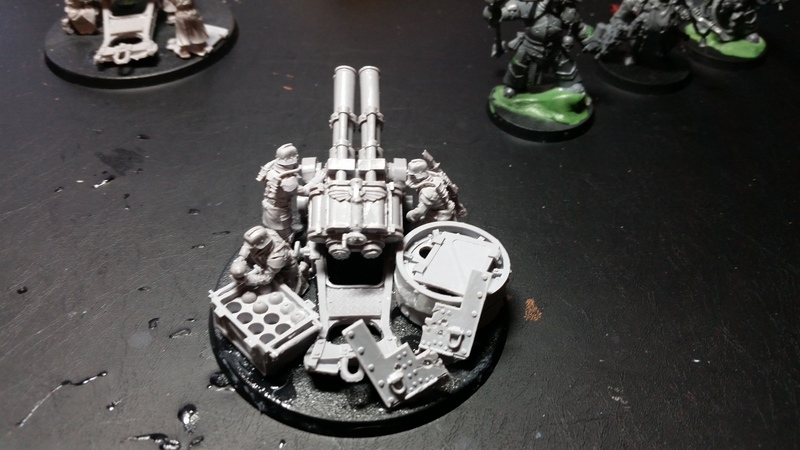 After a momentary dip into crisis mode, I began to formulate a plan to boost my army score, test my abilities as a hobbyist and improve the look and feel of my army both on the table and in their fluff. As mentioned in my first article I had envisioned my renegades were once loyal Death Korps guardsmen who had the unfortunate circumstance of living in the Warhammer 40,000 universe. Sent to garrison and hold the line in the irradiated mountain range of a backwater planet, the Death Korps unwittingly dug their trenches over an ancient and long-lost Nurgle sanctum that still housed pilgrims seeking enlightenment from Father Nurgle. Champions of the Word Bearers now known as “The Learned Sons”, who had made their pilgrimage to the mountain in a time immemorial, stirred and rose from their previously undisturbed meditation and became quite curious as to what broke them from their trance. Being devote Word Bearers, they would set about preaching the good word of Father Nurgle to the Death Korps. The guardsmen were doomed to a fate worse than death the minute they dug their trenches. They are now an extension of the virulent body of Nurgle, cursed in a state of quasi-life where they are fully conscious but unable to stop the horrors their bodies are compelled to commit on themselves, each other and the Imperium of the God-Emperor. Any hope of righteousness, even in death, has withered and died before their eyes. Madness is now their only salvation from reality. With this clear idea in mind, I set about creating these infamous “Learned Sons”. From the beginning, I knew the Putrid Blightkings from the Age of Sigmar range would be the foundation for the Word Bearers. Being amazing models on their own, they offered a myriad of conversion possibilities and conveyed the essence of a true scion of Nurgle. In order to bring them into the realm of the 41st Millennium, I used various bits from the plastic Cataphractii Terminators set and various imperial bits, such as purity seals, from my bits box. The lower leg pieces of the Terminators proved highly compatible with the Blightkings. 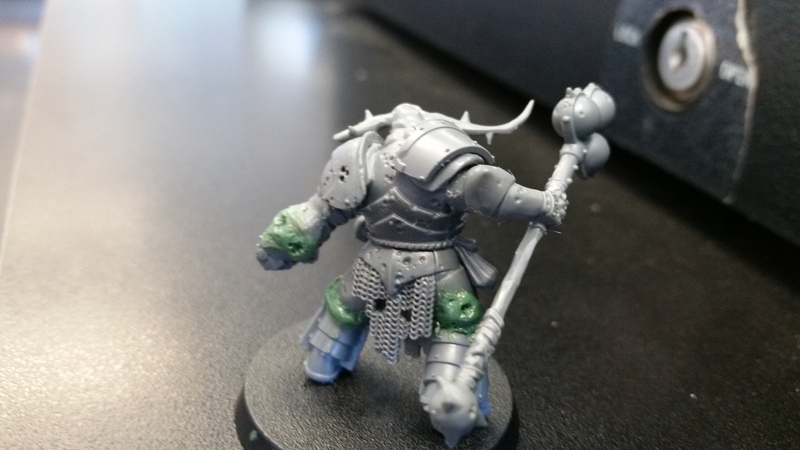 Some leg pieces could be glued onto the corresponding upper leg of a Blightking and require only a small amount of green stuff to fill in the gaps. The most important part of these conversions was making the green stuff reflect the aspect of Nurgle and blend the two different ranges together. This is best achieved by sculpting bloated fat that has the occasional open sore or is enveloping a piece of armor. 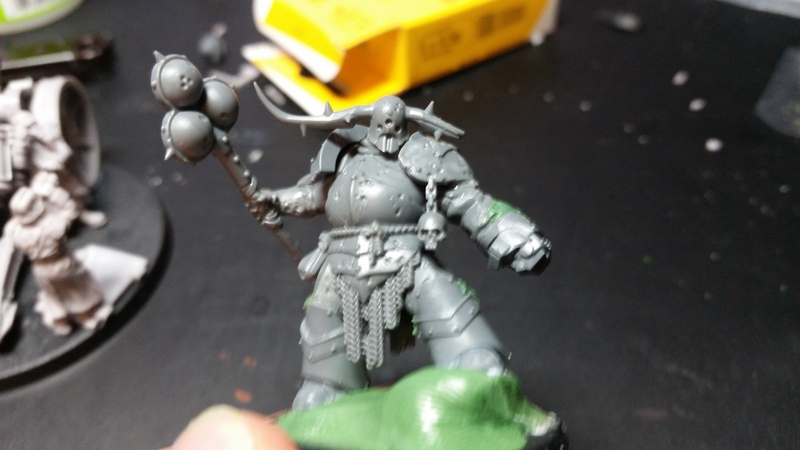 So long as you have vision, creativity and patience to try out a similar conversion I’ve found that, despite my novice sculpting ability, these are far easier to pull off. I currently have three built and will be working to finish the other two in the near future. I recently removed two from their bases in order to elevate them using green stuff. This gives them a much more menacing vibe and offers interesting basing opportunities when the time comes. 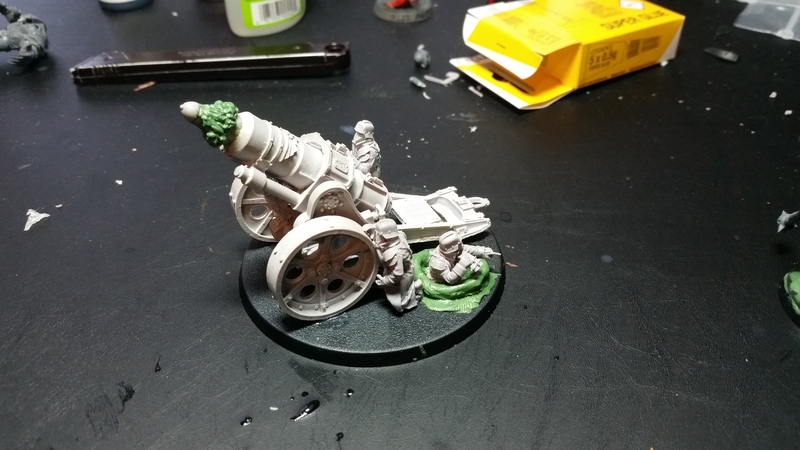 I also stated in my first article that I did not want any artillery piece to look the same as others in the unit. Instead of having each crew model on his own base and the artillery piece free standing, I opted to have my field artillery mounted on 80mm bases. Everything but the crew will be glued on the base before priming, so that I can paint the crew with ease. With the size of my order, it was not hard to mix and match pieces or even entire models to comprise each piece’s crew. I made it a distinct goal for each artillery piece to have a scene being played out on their base. One of my Thudd guns displays two engineers looking over the gun after it had sustained some damage as a third renegade retrieves a shell from the ammo crate, ensuring that the bombardment will commence on time and at it’s maximum efficiency (Once painted, this scene will always get a chuckle out of me, as the engineers look over a horribly weathered and degraded cannon with the intent of getting it back into complete working order. The third guy knows what’s up though: If it somehow can still fire at this point, why bother with something as trivial as the cracked plating?). My Heavy Mortar unit is what will ultimately steal the show. For the mortar whose shell has completely left the barrel, I used the unused brass rod that came from the HQ Command Squad to create the skeletal structure of the shot. I drilled into the center of the barrel and in the center of the shell’s fins, then glued the rod into both. 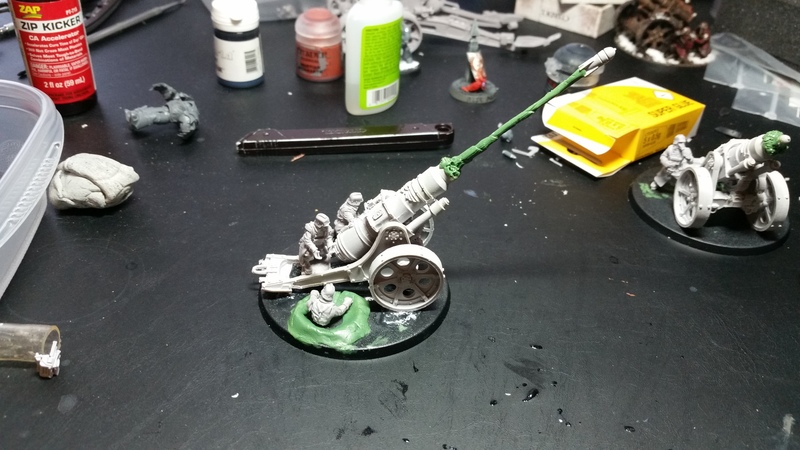 After that, I began the process of sculpting green stuff over the rod and around the barrel rim. I used the sculpting tools from GW and a hobby knife to create the texture of the smoke and to add a feeling of motion. I constantly wet my tools and fingers with water to prevent finger prints on the green stuff and to lower the possibility of a tool tearing off previous sculpted green stuff during the process. I was quite pleased with the end result and am currently wracking my brain with ways to pull off an even more spectacular effect on my Medusa Siege cannon. Lastly, I sculpted a rough ring shape onto each base. This will serve as the foundation to what will eventually be a crisper looking spider hole with a renegade pooping out to aid his comrades. My texture paints will ultimately make the rough outline worth adding them onto the base. Though they’ll be primed at the crack of dawn from the time this is being typed, they won’t be given serious work put into them until my mass infantry batch painting is finished. Though that will be a story for another article.